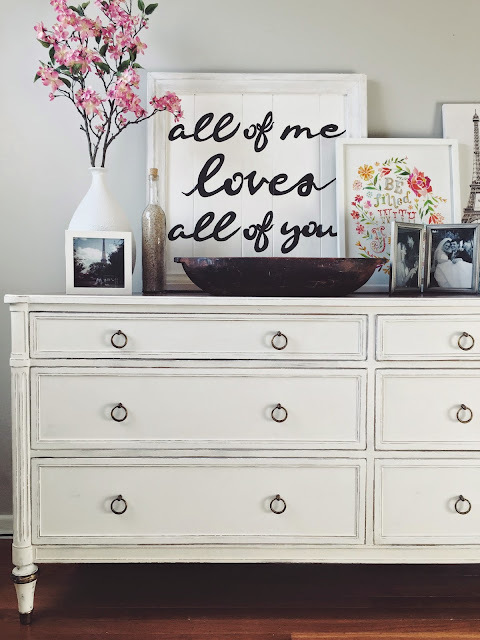 Not long after Tim and I got married, we got tired of our hand-me-down bedroom furniture, so we went out and bought a big matching set of bedroom furniture. It seemed like the grown-up thing to do at the time. A few years later, I had something of an awakening when it came to decorating our home and I realized that our bedroom furniture (as well as everything else in our house) just wasn't my style at all. The bedroom set we bought was big, bulky, and dark. It completely overwhelmed our space and I didn't see anyway to make it look better. I wish I could find an old picture for you. I really wanted to start completely over, find pieces that I really loved, and create a room that was lighter and brighter with an eclectic mix of unique pieces. So after some major convincing on my part, Tim let me sell our bedroom set on Craigslist. I've learned that finding what I love takes time. It takes patience, persistence, and it takes not settling. But after selling our bedroom set, we had no furniture and our clothes were just sitting there all piled up on the floor. Obviously we needed something immediately to hold it all. So we went to Ikea and bought two dressers that would hold our things until I found what I really wanted. Over those four years, I've been on the lookout for a dresser. I've looked on Craigslist, in thrift stores, antique stores, etc... I knew I wanted a solid wood, vintage piece that I could paint. I wanted it to have clean, straight lines, so as not to be overly feminine, but also have some interest to it. And since we moved to a smaller home a few years ago, we now only have space in our room for one dresser, so it needed to be big enough to hold both mine and Tim's folded clothes. 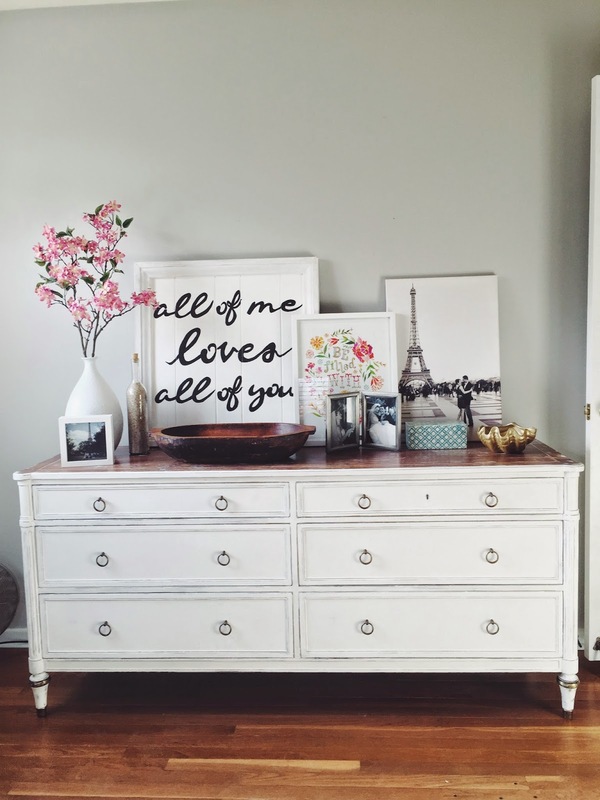 Finding a dresser with all of these qualities was not easy, but I stayed patient. Then a few weeks ago, my in-laws were here visiting and we were loading up in the Jeep getting ready to go to Target when I got a text from a neighbor alerting me to a "darling long dresser... really unusual... lots of potential" that someone had sat out on the side of the road in our neighborhood for the trash pick-up. This neighbor knows me and knows my love for painting and making over old furniture. Obviously I was interested at this point. So we drove off to find the dresser. As I pulled up to it, I immediately noticed it's unique vintage look. It was extra long and had clean, straight lines. I hopped out to give it a closer inspection. 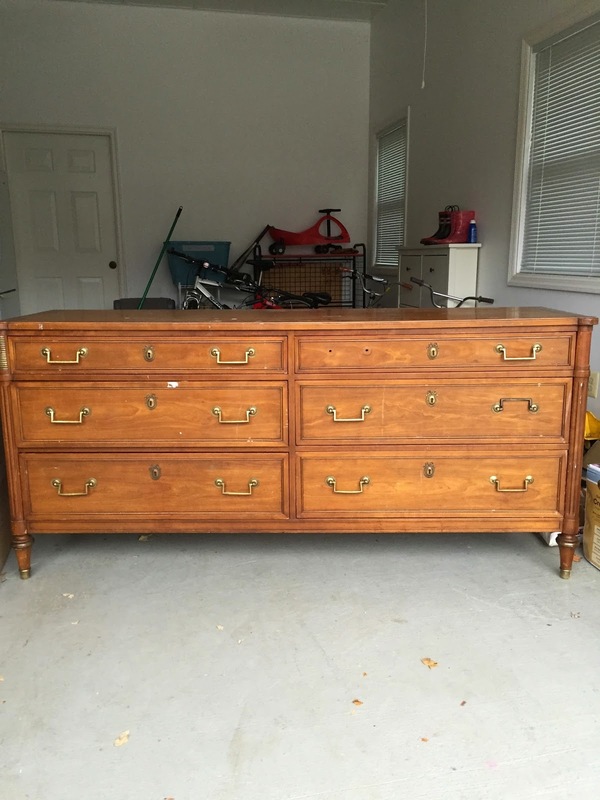 I wanted to check if it was solid wood (yes), to make sure the drawers worked (yes), and that they were in good condition (yes). I could see the potential in it and I knew I wanted it. So Pop Pop stayed back to guard the dresser while Mimi, Hudson, and I went home to get the van (since the dresser was not going to fit in the back of the Jeep). Within the few minutes we were gone, three people stopped to look at it and the trash truck showed up to take it away in the trash. We pulled up with the van just as Pop Pop was telling the trash guys we were going to keep the dresser. This was perfect timing because instead of throwing the dresser in the trash truck, those guys kindly loaded it up in the back of the van for us. I was so thankful for that because it was such a heavy dresser that we would have had an extremely hard time loading it up ourselves. The next day we removed all the hardware and I wiped it down with a liquid sander/de-glosser. Using the sander/de-glosser wasn't necessary (according to chalk paint directions), but I had some on hand and figured it could only help. Then I got right to work painting it with Annie Sloan pure white chalk paint. I have always loved her chalk paint because there is no real sanding or priming involved, so you can go straight to painting. This is perfect for me, as I am always anxious to start seeing the transformation. But this time, I had problems. After I painted the main part of the dresser, I noticed that there were several spots on the top that were cracking and peeling as the paint dried. I had never seen or heard of this before with chalk paint, so I was pretty confused and frustrated. I hand sanded down those spots and re-painted only to have the same thing happen again. After googling this, I discovered this does happen sometimes with AS chalk paint and there doesn't seem to be a clear reason why. 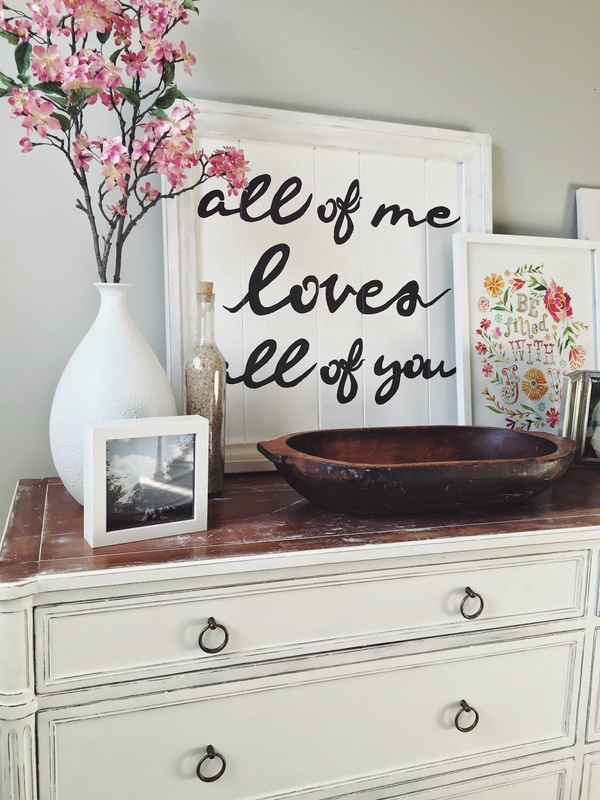 It seems to happen most often with the pure white and old white colored chalk paint though. My suspicion was that something oily had spilled on the top of the dresser and this was keeping the paint from adhering in those spots. Through googling, I learned that I could try sanding down the entire top, then putting a layer of shellac down, and then re-painting. Not fun, but since there didn't seem to be another real option and we didn't have much to lose at this point (except our time and a few bucks for shellac), we decided to give it a try. BUT.... after sanding the top all the way back down to the wood, I completely fell in love with the overly distressed look and decided not to re-paint it after all. I just sealed it with the Annie Sloan wax and called it done. It was a perfectly happy accident. At this point, I loved how it looked, but we discovered that it had a bit of a bug infestation. Yuck. So Tim had to take it back outside to spray it down twice with bug killer. The drawers were also extremely smelly. I googled this problem too (what would we do without the internet?) and found all kinds of ways to get the smell out. I tried many of them. I wiped them out with a vinegar/water mixture, set coffee grounds in cups inside of them, let them air out outside... none of that worked very well, so I ended up polyurethaning the inside of all the drawers. I'm glad I did because I feel like that sealed up any germs and smells, so they won't get on our clothes, especially since we really don't know where this thing has been or what has been inside of it. 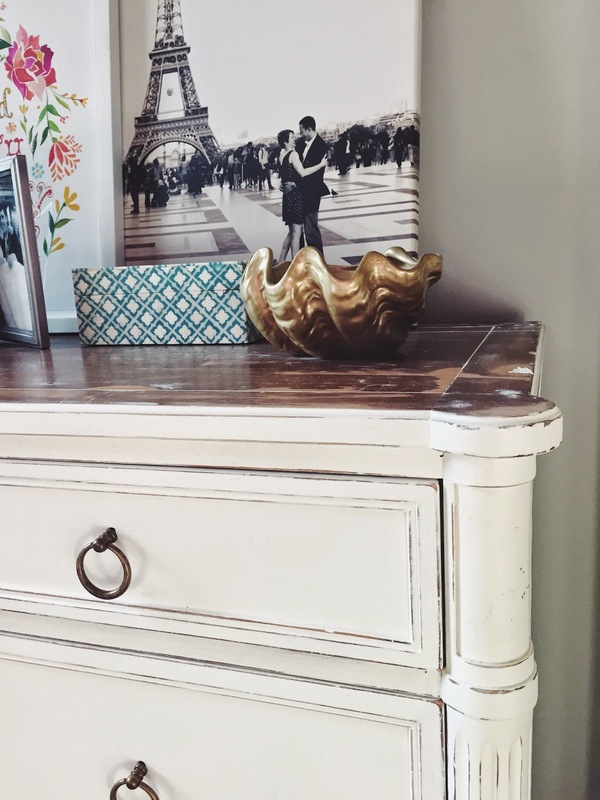 As many issues as this dresser came with though, I absolutely love how it turned out and I think it was totally worth all the extra effort. 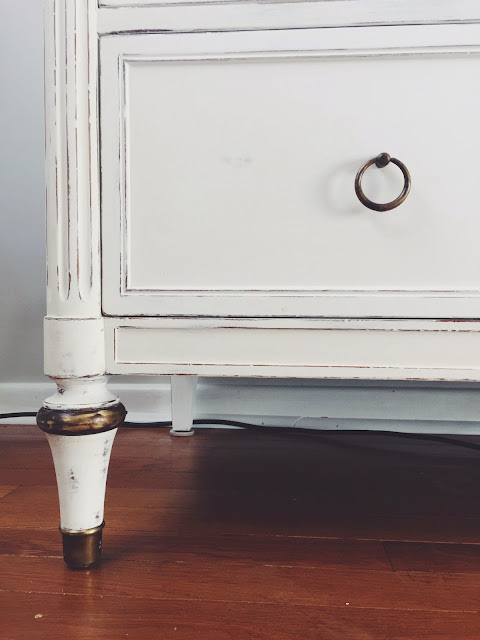 I ordered these brass ring pulls and I really like their classic simplicity. 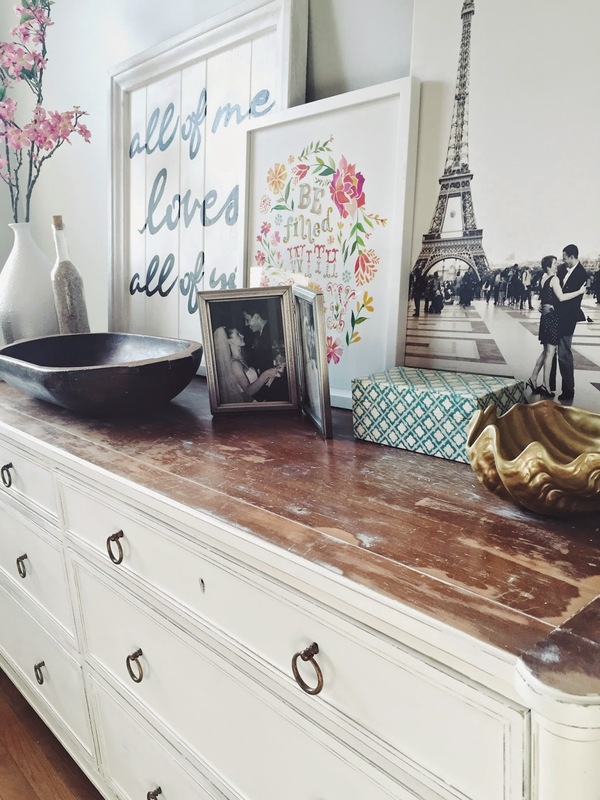 There is brass on the front feet of the dresser too, so they complement each other nicely. I also really like the detailing of the round front edges. It's not overly fancy or anything, but it adds some extra interest to the piece. The most fun thing about these projects is seeing the amazing transformation. It's not quite what I had envisioned when I started this project, but in the end, I love it even more than I originally imagined. I love that it's unique. I love that it has a story behind it. I love that my in-laws were involved in finding it and helping me haul it home. And I love that Tim and I both worked on it to make it our own. I hope it will be something that we have and enjoy for a very long time. What about you? Have you ever had a project go all wrong, but then end up better than you ever thought? 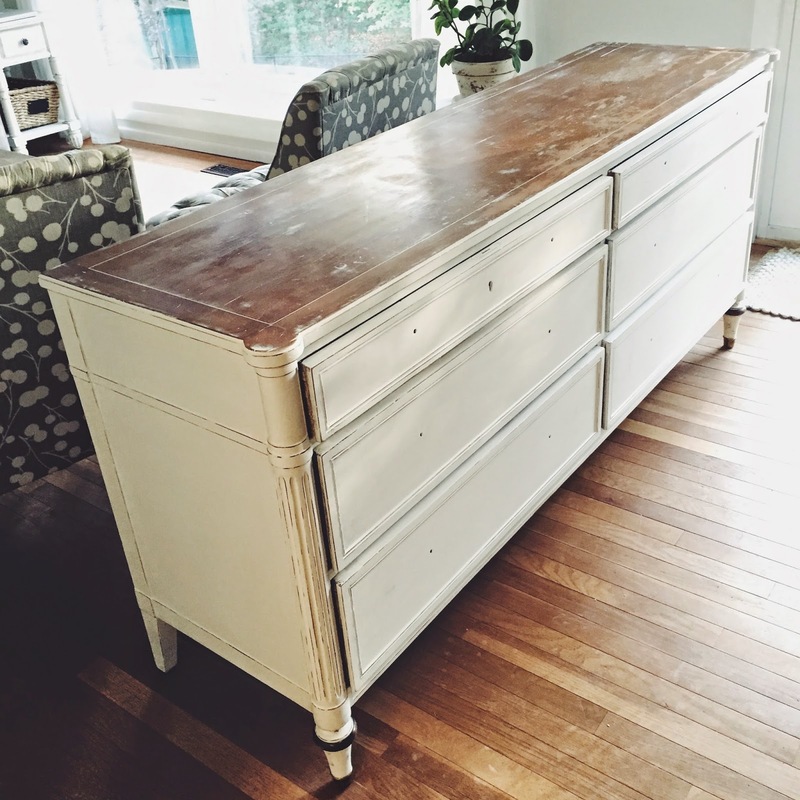 Every time I hear a story like this about a great (free) find I wonder when I will be so lucky! The dresser looks awesome - you did a fantastic job on it. That looks amazing - great save!